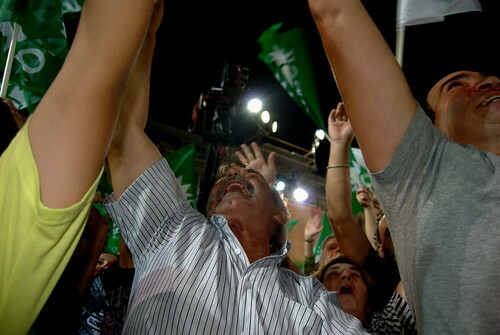 Behind the scenes at last night's PASOK rally in Thessaloniki, originally uploaded by Teacher Dude's BBQ. 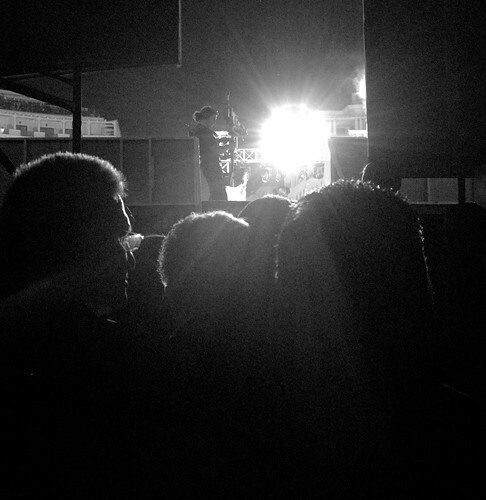 Once again I managed to get behind the scenes at an election rally and took this picture as the PASOK candidates were about to go onstage after a speech by party leader, Giorgos Papandreou in Aristotelous Square last night. The atmosphere reminded me of the scene from the film Gladiator when those about to fight are waiting in the tunnel, just before walking out into the Colosseum. Γιώργος Παπανδρέου - Giorgos Papandreou, originally uploaded by Teacher Dude's BBQ. With elections just days away the Greece's socialist opposition seems set to take power in the parliamentary elections this Sunday. 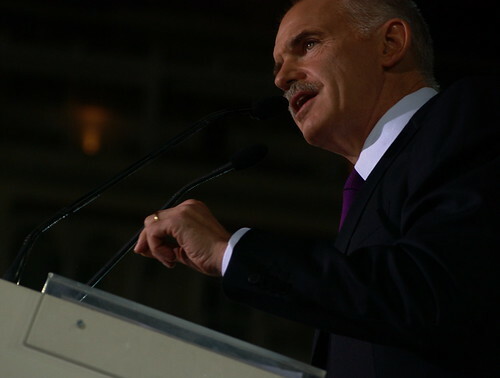 PASOK leader, Giorgos Papandreaou addressed thousands of party followers in the northern port city of Thessaloniki, promising to bring drastic changes to the way the country is governed. Although opinion polls have recently been banned by the government in the run up to elections, leaked reports on the internet put the ruling conservative party 7-8% behind their socialist rivals. 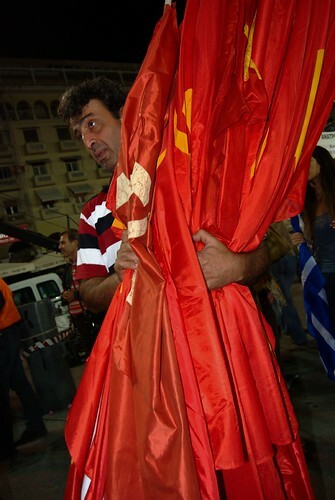 Greek communists (KKE) rally in Thessaloniki, originally uploaded by Teacher Dude's BBQ. Leader of the Greek communist party (KKE) addressed the party faithful tonight in the centre of Thessaloniki ahead of next month's parliamentary elections. Lately, I have been doing more and more work with younger learners and thankfully, the material that is available is much more interesting and effective than the dull EFL/ESL books that older learners have to suffer. On the other hand, I still like doing my own stuff using new technologies when possible. This week I helped my students film a story book using free software and the kind of electronic equipment that is becoming common place, at least here in Greece, the result was two hours full of learning opportunities which ere fully exploited by my two nine year old students. 1 Give students a book to read at home. In this case I handed out My Daddy by Curtis Jobling which the students enjoyed very much, even if it did include some vocabulary which was beyond their level. More and more such books have any accompanying CD the story read aloud, that would be the ideal choice. 2 Next lesson get students to tell you what they liked about the story and read out some of their favourite parts. 3 Now explain that they are going to make a film using the story from the book. If time is short or the books too long then choose just one part. The students need to think about what kinds of props they are going to need and what parts of the book to they need help with in terms of understanding and pronunciation. 4 To make they film students need one of the following; digital camera, video camera, mobile phone with audio or video recording capability or a webcam. 5 The students then decide in groups who is going to play which roles, who is going to operate the camera etc. 6 Students rehearse their performances and then record them when they feel ready. Since the books probably has lots of vocabulary allow them to have the book where they can see it. 7 Students video their performances and encourage them to redo anything they are not happy with. 8 Put the footage on a computer. Windows Movie Maker (click here to see a video tutorial on how to use it) is a good program to create a short clip and it comes as standard with every copy of Windows. If there is an open source/freeware program that does the same kind of thing for Apple or Linux then please let me know. 9 Of course a good part of the lesson will involve teaching students how to use the program , however, if Windows is in English this is another great learning opportunity and once the learners figure it out you won't have to do it again. 10 Students then present their videos and if possible post them onto a class blog or website. As you can imagine there is a good deal that can go wrong with such a complicated exercise in a large class but I feel that it is worth the effort as it allows for an enormous amount of real life language use. In addition the fact that student listen to themselves speaking English is a great way to allow them correct any problems they have with their speaking skills. Yesterday the Direct Democracy Omnibus made its appearance in Thessaloniki. The bus is part of a German based initiative aimed at promoting the idea that people take responsibility for their own lives rather than just leaving it to organisations such as parliaments. "This new foundation of democracy can only occur directly; hence, direct democracy. “Direct” means that it can only sprout within the human self, and that it can also only be implemented directly by him or her, in the form of direct votes on all essential questions which concern everyone. The principle of “election” must be supplemented at all levels by the principle of “referendums.” The suitable form for that is a three-stage structure: the popular initiative, the petition for a referendum, and the referendum vote." Today they will be in Delphi then they are off to Athens then Leptokaria. 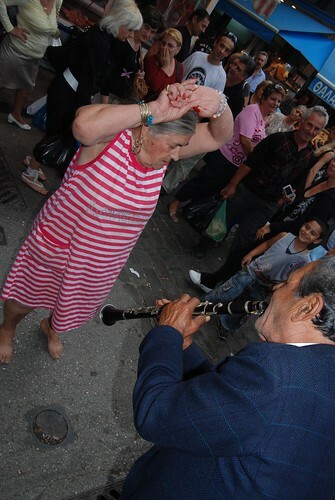 They will be back in Thessaloniki from 15th to 18th October (see here for the rest of their tour program). Here is some video of their work in Sofia, Bulgaria. Democracy in Motion: Episode Sofia "Sofia Initiatives" from OMNIBUS on Vimeo. Dancing in the streets, originally uploaded by Teacher Dude's BBQ. As those of you who follow this blog know this has been a difficult time for me. So I have to say thanks to Orhan, Eleni and Dimitris for getting me out of my rut and persuading me to join them on a walk with our cameras through the centre of Thessaloniki. My friend lies dying in a hospital in London, I have just found out. His chances of surviving are diminishing as time passes, his body is growing weaker and weaker as the effects of liver illness continue to affect other major organs. 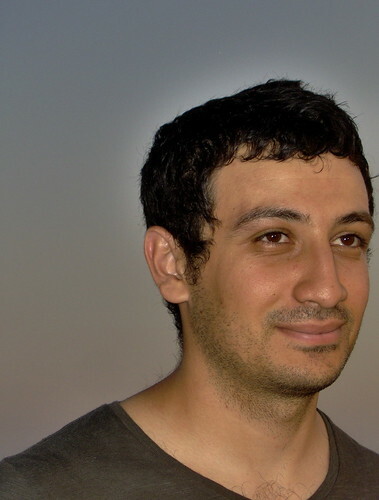 There is a good chance that if he had a transplant he could survive but it seems that he will not be given one even though he was flown at great cost and great risk from Cyprus in the hope that such an operation would be possible. I'm not there so I'm not sure what lies behind the decision. Perhaps it is the fact that my friend's condition was the result of heavy drinking which escalated after the loss of both his parents a few years ago. Public opinion was outraged by the George Best case a while back so such patients are now considered less "worthy" of transplants.It could be the result of the outcry which followed the revelation that Greek and Cypriot patients were being given liver transplants even while UK citizens remained on waiting lists. I don't know why and I don't care. All I know is that my friend is dying and he could be saved. After losing my mother to cancer earlier this year I find the possibility of such a needless tragedy more hurtful than I can bear. I thought I'd share some teaching ideas that I have tried with you. They have worked for me but they may need to be amended to fit in with your learning situation. 1 Ask you students if they have heard of any weird, strange or odd stories in the media. 2 Now explain to them that they will watch BBC's Odd Box broadcast which has 10 unusual stories every week. Put them in groups of two - four and show them the clip (about 4-5 minutes long), first without sound and ask them to guess what they story might be about. 3 Students then discuss their guesses and write a sentence for each. 4 Show the sequence again, this time with sound. 5 Student work together as groups then as a class in order to come up with a definitive answer. 6 Now tell learners that they will make their own version of Odd Box using stories and video on the internet. First phase - Finding stories. A useful starting places include the BBC's Also in the News page, Yahoo's Odd News, Reuter's Oddly Enough etc. 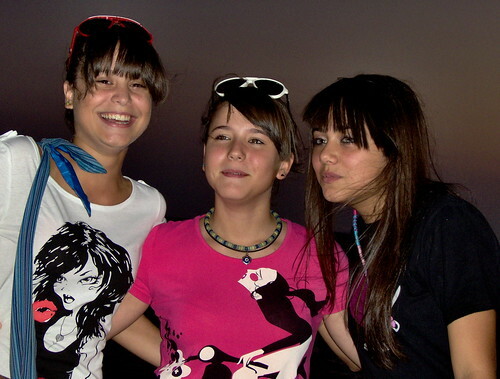 Ask students to choose five stories that would be interesting for a Greek TV audience. Next stage involves finding video that goes with the story on Youtube or Google Video. In order to use download and edit the videos I would recommend Real Player (which allows you to download and convert videos) and Windows Movie Maker (which comes as standards with every copy of Windows) to edit the videos and add titles and voice over. Both programs are free and relatively easy to use, though the more you familiarise yourself with them the more comfortable you'll feel when teaching. The students then work in groups so as to edit a two minute video with their own voiceover. Alternatively, student add their own video presentation segments which can be recorded with mobile/cell phones, vieo camera or a digital camera. We screen the videos and decide which one would be best for a class blog/web page etc. Of course such exercises have all kinds of potential pit falls which may ruin the lesson but I feel that the learning payoff involved is worth the risk. How long can we go on using 19th century technology to promote medieval learning paradigms? The school year has started once again here in Greece and once again I am getting back into the swing of things a far as teaching is concerned. I have started lessons with new students and as is often the case I have been appalled by what they have been put through in the name of EFL/ESL. Case in point being a pair of teens who were forced to get through 10, yes 10 exam practice books as a way of preparing for their B2 level exams. No other material was provided and these poor guys had to wade through hundreds of pages of test items. No wonder they were wary about continuing their foreign language education with me. I quickly assured them they would not be doing anything as dry and soulless as this. 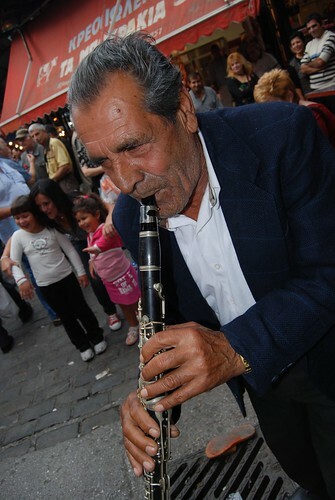 With the growth in number of ESOL examinations recognised by the Greek state the response of the the private language sector (where the bulk of language teaching takes place) is to turn intermediate level classes into little more than exam pratice lessons which do little more than repeat the format of whatever examinations are being taken. There is very little principled teaching of skills, functions, syntax, phonetics or anything else that might effectively help a person attain proficiency in English. All that matters is that students do an endless list of exercises that may come up in the examinations they are going to take. Of course this scatter gun approach is time consuming, expensive and extremely ineffective. However, by the time that becomes apparent, the frontisteria (Greek private schools), publishing companies and exam providers have all made handsome profits out of hapless parents and robbed students of hundreds, if not thousands of hours of their youth. Personally, this is a good thing, as cynical as it may seem as the latest generation of parents have come to realise the huge scam being committed and have started to look or alternative teaching opportunities and so come to me looking for something different. On the other hand schools have responded to this crisis by cutting cost and reducing the quality of the education offered even further. Low wages, chronic job insecurity and dubious contracts mean that teaching English in Greece has become a McJob where the youngest and cheapest are favoured and anyone with experience or qualifications are deemed a waste of money. 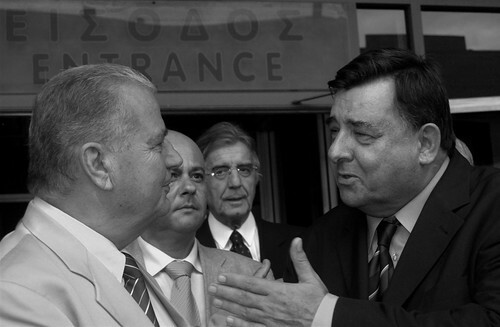 Giorgos Karatzafaeris, head of Geece's far right LAOS party (right) condemned by the Europe Commission Against Racism and Intolerance for anti - semitism, originally uploaded by Teacher Dude's BBQ. 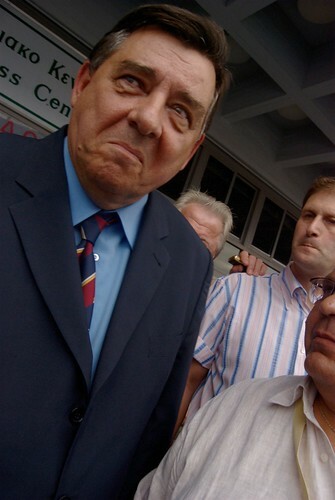 "The leader of a right-wing extremist party ( LAOS led by Giorgos Karatzaferis) , which won approximately 3% of the votes in the 2007 parliamentary elections, often makes public antisemitic and racist statements, including blaming immigrants for a surge in drug-related crimes and violence. Thus far, he has not been prosecuted for any of these statements under Law 927/1979." 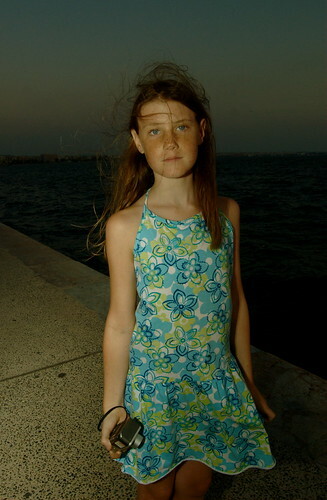 Street portraits, originally uploaded by Teacher Dude's BBQ. 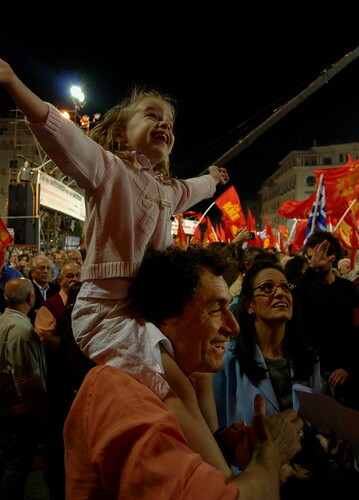 Greek elections 2007, originally uploaded by Teacher Dude's BBQ. It should be interesting to see what, if any impact social media will have on the coming national elections here in Greece. 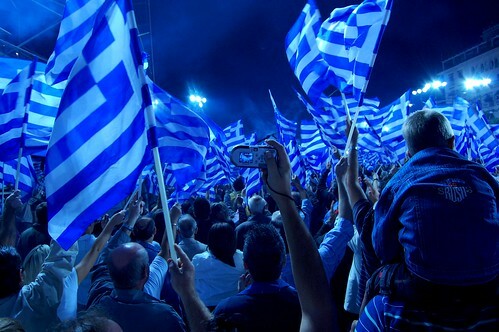 Of course the decision to call elections at such short notice has caught many on the hop but I shall be keeping an eye out for what is happening on the Greek language blogosphere and other outlets such as Twitter, Facebook and Youtube. I think there is the dawning realisation that the internet will become more important in the future as far as getting the message out to voters is concerned but still the kind of web based electioneering we saw in the last US presidential campaign is still far off. Use of the internet remain low and those in charge of the political parties' campaigns continue to put their faith in more traditional media channels such as TV, radio and newspapers, which will get the lion's share of the millions that are going to be spent in the next three weeks. On the other hand all parties have got a significant presence on the internet and are slowly starting to exploit platforms such as blogs, though these still tend to be just places to display material produced for other sources. I don't see much evidence of grass roots use of such tools to get voters out or co-ordinate activism. I shall be following events with my camera as the various parties roll through Thessaloniki and give press conferences and organise rallies. Usain Bolt in Greece, originally uploaded by Teacher Dude's BBQ. "Usain St. Leo Bolt, C.D. 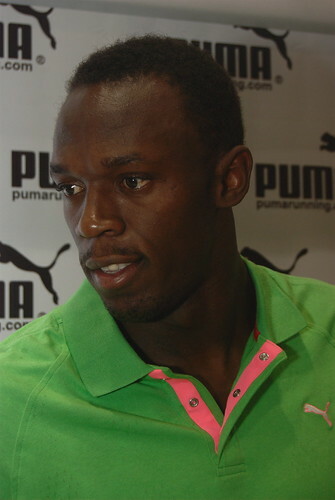 ( born 21 August 1986), is a Jamaican sprinter and a three-time Olympic gold medalist. He holds the world record for the 100 metres, the 200 metres and, along with his teammates, the 4x100 metres relay. He also holds the Olympic record for all three of these races. At the 2008 Summer Olympics, Bolt became the first man to win three sprinting events at a single Olympics since Carl Lewis in 1984, and the first man to set world records in all three at a single Olympics. In 2009 he became the first man to hold the 100 and 200 m world and Olympic titles at the same time." Usain Bolt, the world's fastest man over 100m and 200m arrived in the northern Greek city of Thessaloniki in preparation for the IAAF / VTB Bank World Athletics Final this Sunday. Alexis Tsipras in Thessaloniki today, originally uploaded by Teacher Dude's BBQ. With parliamentary elections just weeks away Greece's radical left alliance, SYRIZA (Coalition of the Radical Left) has launched its elections campaign with a withering attack on both the ruling conservative New Democracy government and it's main socialist rival, PASOK. Speaking today at a press conference in Greece's second largest city, Thessaloniki, leader of SYRIZA's parliamentary group. Alexis Tsipras attacked the government's bank bail out policy for supporting the country's financial institutions with public money at a time when they have reported massive profits. 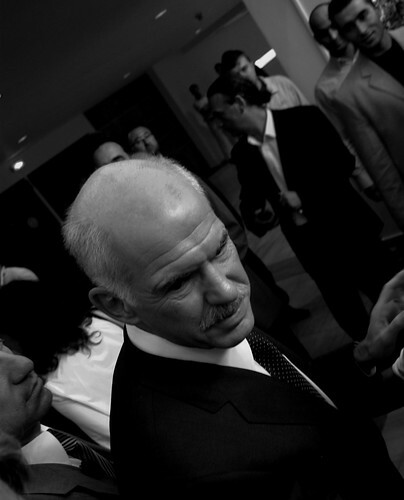 In addition Tsipras poured cold water on the idea of any possible post election coalition with the PASOK party of Giorgos Papandreou. However, SYRIZA, which is made up of several smaller left wing parties has itself found difficulties with leadership battles and an electorate that failed to respond to the party's platform in the recent European parliamentary elections. 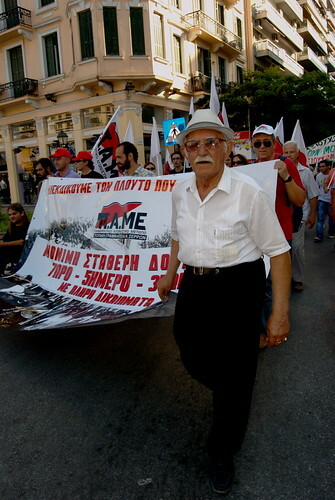 Greek communists kick off election campaign, originally uploaded by Teacher Dude's BBQ. After months of speculation the announcement of snap elections by the Greek prime minister, Kostas Karamanlis last week has seen a flurry of campaigning activity amongst the country's main political parties who are rushing to get their campaign for October 4th parliamentary elections underway. Last night leader of the Greek communist party (KKE) Aleka Papariga addressed the party faithful at a rally in the northern port city of Thessaloniki. She said that the party, which currently has 22 MPs in the 300 seat Greek parliament offered a chance for voters to reject the failed policies of both the ruling conservative, New Democracy party and their socialist rivals, PASOK. Street portrait, originally uploaded by Teacher Dude's BBQ. Part of an ongoing project which I can not talk about under pain of death, or at least many hard stares. I was just thinking what I've been up too over the last couple of weeks and it seems to mount up. Went on some demos, got tear gassed, chased by the riot police, stopped by the regular ones, gatecrashed a far right press conference, took pictures of the communist party leader, designed posters, wrote articles, continued an ongoing photography project, did my lessons, got interviewed by the BBC World Service, attended a party, spent time with my daughter, made a video, read some books and of course blogged about it all. Don't you just hate it when you get stuck in a rut? Karatzaferis was speaking in Thessaloniki this afternoon. As head of the far right LAOS party he has spearheaded a campaign for mainstream legitimacy with regular appearances on TV chat shows and the like. The party was one of the few to make any gains during the recent European parliamentary elections, draining votes from the unpopular conservative New Democracy party. However, like so many politicians of his ilk he has more than a few skeletons in the closet, as this 2007 article from the Greek national daily, Kathimerini points out. “First of all, I am not a Jew. Can the prime minister say that of himself? Secondly, I am not a communist. 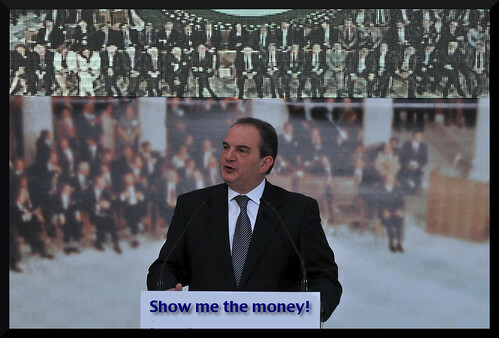 Can Mr Karamanlis say that?” asked LAOS leader Giorgos Karatzaferis, speaking in Corinth on May 28, 2002. “Thirdly, I am not a homosexual. There aren’t many who can say that,” he added. He was not widely quoted at the time, but Karatzaferis is given to making remarks of a similar nature, and had in the past made reference to a grandfather of then Prime Minister Costas Simitis, Aaron Avouris. Just hours after the shooting of 15 year old Alexandros Grigoropoulos by a police officer in the Exarchia district of central Athens, hundreds started violent protests that would last for weeks and cost the country billions of euros in damages. Despite the ferocity of the response to the killing it seems that the Greek authorities have yet to appreciate the potential for backlash created by accusations of police violence. One of the major driving forces behind the December riots, the worst in modern Greek history was the conviction that the officer involved would not be punished. In the latest case the recently formed Delta motorcycle unit stand accused of using excessive force in the arrest of a 27 year old man last week in Exarchia. 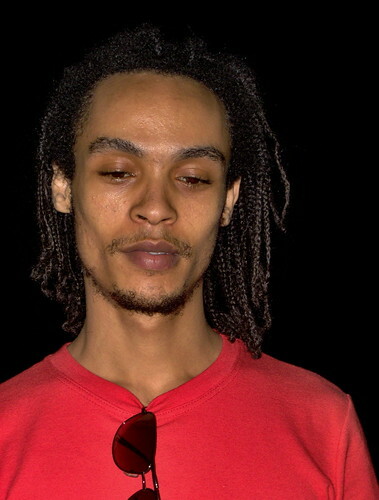 According to report in today's national daily, Eleutherotypia the unnamed man was detained and beaten by several police officer who left him with broken ribs and a punctured lung. Afterwards he and four others who had also been detained were tied to a tree. The official police report states that the detainee had been stopped during a routine check and arrested for carrying explosive materials, GBH and resisting arrest. Throughout most of last Thursday night police and youth clashed in a series of running skirmishes in the area. As the article in Eleutherotypia points out it is a standard police tactic in such cases to charge victims of police violence with serious crime in order to justify their treatment. 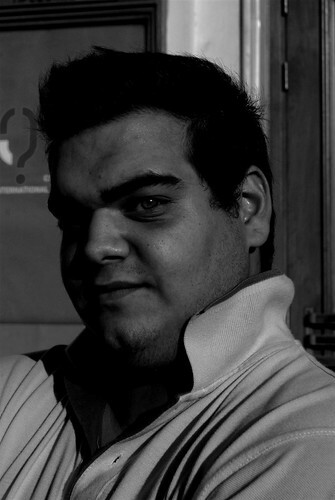 In a similar case in November 2007, Cypriot student, Augustinos Dimitrios whose brutal beating was captured on live TV was charged with resisting arrest. Similarly, the police officers charged with the killing of Alexandros Grigoropoulos in December first stated that they had acted in self defence after allegedly being attacked by a group of stone throwing youths, including Alexandros. Despite the appearance of amateur video footage the following day which contradicted the official version of events the authorities insisted on sticking with the officer's discredited account for weeks. 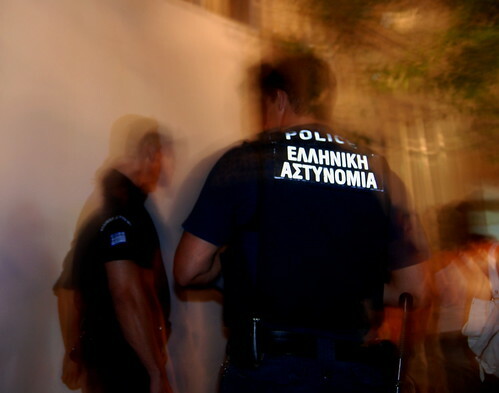 The Greek police force has routinely been the object of critical attention by organisations such as UNHCR, the European Union, Amnesty International and other human rights groups. 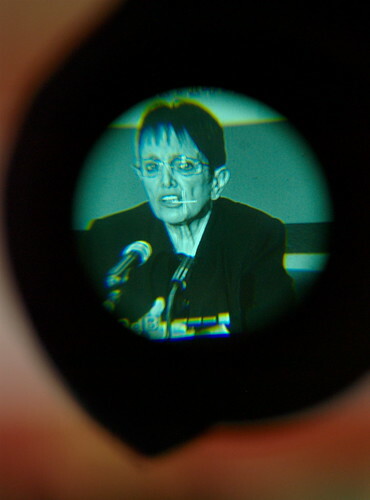 In both 2005 and 2008 the Council of Europe’s Committee for the Prevention of Torture (CPT) roundly condemned the Greek authorities for turning a blind eye to the violent treatment of prisoners and suspects by prison and police officers (click here to see report). Naming the dead, originally uploaded by Teacher Dude's BBQ. Greek forest fighters remember colleagues lost over the last few years. They were protesting outside the 74th International Trade Fair for better conditions and an end to the system where they are fired every year only to be rehired the following summer. Unfortunately, not everyone was moved by their plight, the police who only yesterday were saying that they, too were the victims of government indifference and whim, edgily fingered their riot shields and batons, ready to employ tear gas should the protest advance any further and so spoil the PM's PR gig. Greek PM's arrival in Thessaloniki met with mass protests, originally uploaded by Teacher Dude's BBQ. 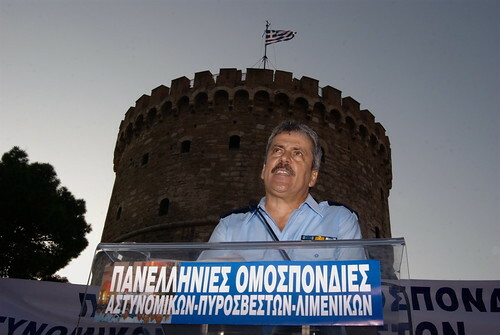 The arrival of the Greek prime minister, Costas Karamanlis in the northern port city of Thessaloniki was met with demonstrations by trade union, political parties and other groups unhappy with the ruling conservative government. Under the watchful eye of thousands of riot police protesters marched through the centre of Greece's second city. Although there were a few minor clashes between anti-authoritarian groups and the police the event passed off peacefully. Following last week's announcement by the prime minister the country is set to go to the polls next month just two years after the re-election of New Democracy. A failing economy, rising unemployment and a series of corruption scandals have eaten away at the government's electoral base. However, political analysts are still divided over whether the main opposition party PASOK will be able to form a majority government and secure the necessary 3/5 of parliamentary seats needed to elect a president in March. Failing that the country will once again go to the polls. For video of the demonstration check out Piazzo del Popolo's one. Amidst draconian security measures Greek prime minister arrived in the country's second city, Thessaloniki to give his annual state of the nation address. With 3000 extra police officers on the streets including 60 platoons of heavily armed riot police the ruling New Democracy party were taking no chances. Tens of thousands of demonstrators took to the streets to protest a wide range of issues. firefighters, teachers, students, anarchists, cleaners and trade unionists marched through the centre of Thessaloniki under the watchful eye of thousands of police officers. The nation will go to the polls on the 4th October following the decision last week by the prime minister to call snap elections just two years after being re-elected. Greek police march ahead of PM's keynote speech, originally uploaded by Teacher Dude's BBQ. "Members of Greece's police force and other emergency services took to the streets of the country's second city to demand better pay and conditions from the government. 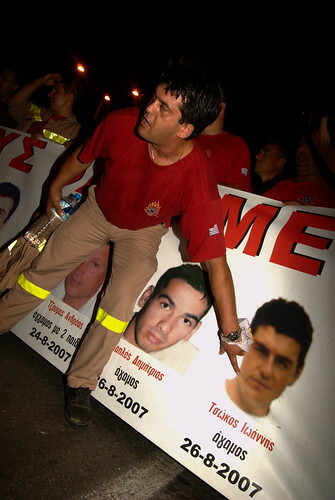 Even as the Greek prime minister was arriving in Thessaloniki for perhaps the most important speech of his career police officers, fire fighters and members of the coast guard demonstrated in the streets. The city is bracing itself for a wave of marches and protests that are expected to accompany Costas Karamanlis's keynote speech during the annual international Thessaloniki trade fair after recently announced snap elections for the 4th October." Apparently, the police think that their contributions to Greek society have gone unrewarded. Don't ask me I'm biased. Yesterday was a full day with lessons to go to, protests to cover and parties to attend. The highlight of the day was Asteris's party which attracted the creme de la creme of the Greek language blogosphere. Anyone who is anyone on Twitter, blogs etc was there. Also it was great once again to see all the people whose work I follow on the net in real life. There was plenty of laughter, ribbing, gossip, dancing and plain ol' fun, which put paid to that tired old cliche that us bloggers write about life as we do not have one our own. Pictures can be found here. I just spent the last few minutes catching up on everyone's via Twitter and once again it reinforces my belief that social media is all about being social, allowing us to connect with others in ways that were not possible beforehand. In a city as big as Thessaloniki it would be very difficult otherwise to meet and keep in contact with so many like minded people without the internet. Portrait by Lydia, originally uploaded by Teacher Dude's BBQ. Not bad for a 10 year old with a 5mp point and shoot. Then again, if you got an eye then it doesn't matter what camera you use. Lydia the photographer, originally uploaded by Teacher Dude's BBQ. Thessaloniki - A small explosive device was planted here, originally uploaded by Teacher Dude's BBQ. 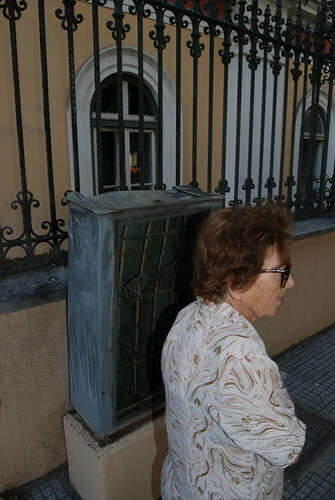 The bomb was planted behind a defunct telephone junction box outside the Ministry of Macedonia and Thrace and went off early this morning, one hour after a larger device exploded outside Athens stock exchange. Unlike the explosion in the capital the one here resulted in just a few smashed windows and no injuries. However, I'm sure a few egos were bruised as the security in the city had been stepped up recently in anticipation of the visit by the prime minister to open the annual trade fair. Though quite how the police hope to fight terrorism by endlessly drinking coffee, looking tough on street corners (mirror shades are de rigueur) and zooming up and down the main streets on motorbikes is beyond me. On the other hand, the forensics guys work quickly here as there was no sign of any activity around the site when I went there midday. I was asked to talk about what I had seen and give my impressions on was happening by the BBC World Service yesterday. Show me the money, originally uploaded by Teacher Dude's BBQ. After weeks of speculation over when the next general elections will take place, Kostas Karamanlis finally announced that the country will go to the polls in October. This means that they economy really is in dire straits as no sane person would call for elections just weeks after devastating fires and with the ruling New Democracy party mired in a series of corruption scandals, Obviously, the PM thought that it is better to bite the bullet now rather than wait till next year when who knows what terrible economic news is going to come to light. 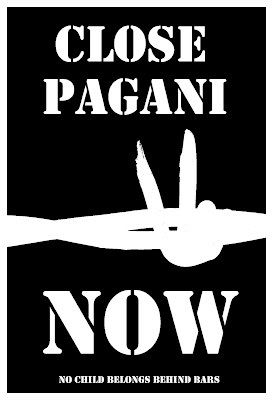 Feel free to download these stencils and use as you see fit. 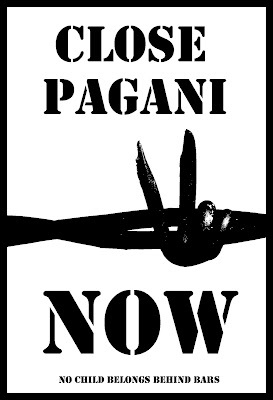 For more on the Pagani immigrant detention centre (Mytilini, Greece) check out these news stories and the No Borders Lesvos 2009 site. For latest developments here is their Twitter page. "GENEVA (Reuters) - More than 850 people including 200 unaccompanied children are being held in shocking conditions at a detention centre for illegal immigrants on the Greek island of Lesvos, the U.N. refugee agency UNHCR said on Friday. 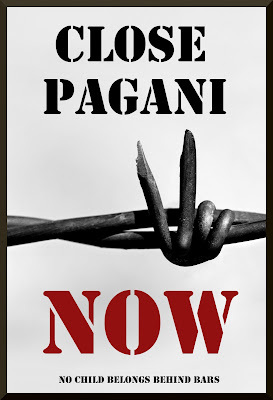 "The report on the centre at Pagani adds to concern already expressed by UNHCR about Greece's treatment of migrants. UNHCR spokesman Andrej Mahecic said commission staff had visited the centre, which has a capacity of 250 to 300, earlier this week. Most detainees were from Afghanistan, he said. "The UNHCR staff described the condition of the centre as unacceptable," he told a briefing. "One room houses over 150 women and 50 babies, many suffering from illness related to the cramped and unsanitary conditions of the centre," he said." "On the 29th of August, it was noborders action day against the practices of the coast guard and their support by the European Border Agency Frontex. At present, Frontex is here in Lesvos with one ship. We have already managed to drive them away once, today, they retreated to the open sea and set anchor there. It was obvious that they couldn't deal with a decent challenge, they seem to prefer to hunt migrants at night. Check http://lesvos09.antira.info/2009/08/l... for a detailed report and background info."